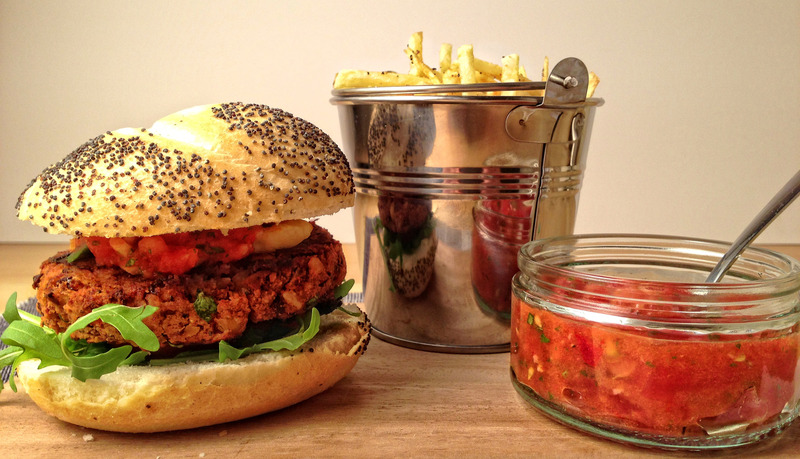 This spicy, Mexican-style veggie burger is packed full of flavour and a super simple to make. Even better, you can prepare the burgers and freeze them in advance, making them really hassle-free. 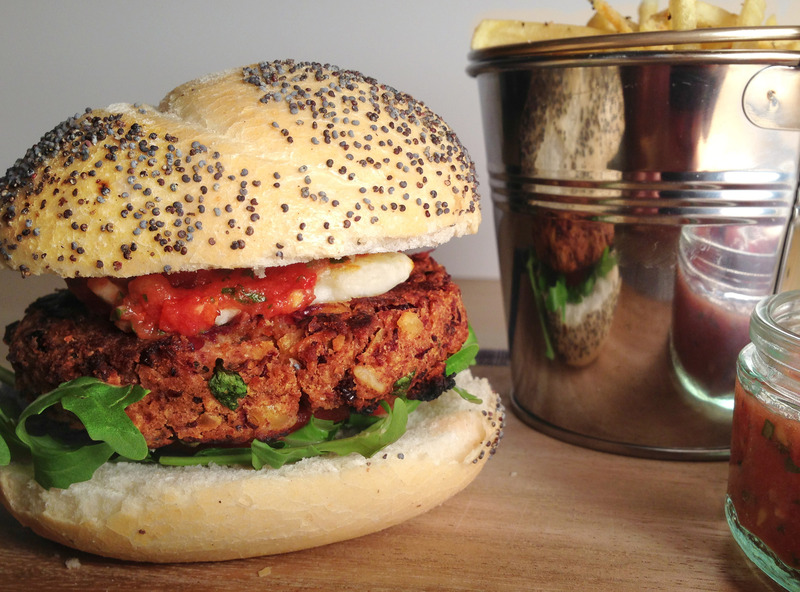 I’ve made this bean burger with a hot, fresh salsa, a handful of rocket and grilled halloumi, but you can add any of your own favourite condiments to suit your taste – I know Matt likes to add some mayo to cool the spice a little. The shoestring fries are very easy to make and you don’t even need a deep fat fryer (I just used a saucepan to prove it!) To finish them off, add some coarse sea salt and cracked black pepper. If you’re feeling crazy, sprinkle over some rosemary for added flavour. Firstly, heat a frying pan on a medium heat and pour in half of your olive oil. Tip in your chopped red onion and fry until they have softened but not browned. Then add in the garlic, chilli, cayenne pepper and paprika and heat for another 2-3 minutes, then leave to cool. Once cooled, tip the contents of your frying pan into a large bowl and add in the kidney beans and chick peas. Grab a potato masher and start mashing! Whizz your bread into fine breadcrumbs and add to your mixture, along with the egg, coriander and lime juice. Give it all a good mix with a wooden spoon – at this point your mixture you start combining. Shape your mixture into 4-5 burgers and wrap each in cling-film. At this point you can either put them in the fridge (if they are being used the same day) or in the freezer. When you are ready to cook your burgers, turn the grill to a medium heat. Heat a frying pan to medium heat and add ½ tbsp. of olive oil. Add your burgers and cook for 3 minutes on each side. Then remove from the frying pan and add your sliced halloumi. Place the burger (halloumi side up) for 3 minutes, until your cheese starts to melt. Place some rocket on the bottom of a burger bun and plonk the burger on top. Then simply add your salsa (and any other condiments of choice) and enjoy! To make the salsa, simply finely chop all of your ingredients and throw them in a bowl together. If only all cooking could be that easy! To make your shoestring fries, peel your potatoes and cut them into very fine strips, slightly thinner than your standard French fries. Dry the potato strips thoroughly using kitchen roll, as you do not want water coming into contact with hot oil. If you are using a saucepan, find a fairly small one and pour in approximately 800ml of vegetable oil and put it on a medium heat. You do not want to heat the oil too quickly, so wait patiently. A cooking thermometer is very handy when you’re not using a deep fat fryer, to keep an eye on the temperature. When your oil reaches around 320 degrees Celsius (608 Fahrenheit) it should be hot enough. A simple way to test it is to put in one strip of potato; the oil should start bubbling around it immediately. When you are ready to put your potato strips in, add a few at a time and very carefully, as you don’t want to risk and hot oil splashing your way. Also, if you put all your fries in at once the temperature of the oil will drop very quickly and you’ll be waiting around forever. Once your fries are in your should leave them for around 3-4 minutes. Take on out to test it is cooked through, but remember to let it cool first! Once the fries are out, place them on top of some kitchen roll and get rid of any excess oil. Once this is done, you are good to go. we made these last night, turned out great. Delicious. Thanks for sharing. That’s great Simon, so glad you liked them! Thanks for sharing!